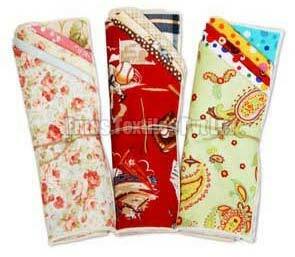 We provide a large range of wonderful Cloth Napkins that is available in a plethora of colors and designs. Our Cotton Napkins are manufactured from the finest quality cotton, under the guidance of experts. Organic Cotton Napkins, provided by us, are available in a variety of colors and designs. Our Cotton Cloth Napkins are a fine blend of contemporary trends and imagination that compliment any kind of decor. Easy to wash, long lasting life and color fastness property are some of the unique characteristics of our Cotton Cloth Napkins. We are well reckoned as one of the preeminent Handmade White Cotton Napkin Manufacturers in Tamil Nadu.